Piyush Steel is one of the prominent Manufacturers & Suppliers of Monel U-Bolts from India. Our qualitative product range finds wide application in diverse sectors of national and international industries. Our qualitative Monel U-Bolts range finds wide application in diverse sectors of national and international industries. Our Monel U-Bolts are known for their features of durability and precise construction. Because of superior technology, attention to minutest details this item from our unit comes with the tag of number one in its genre. 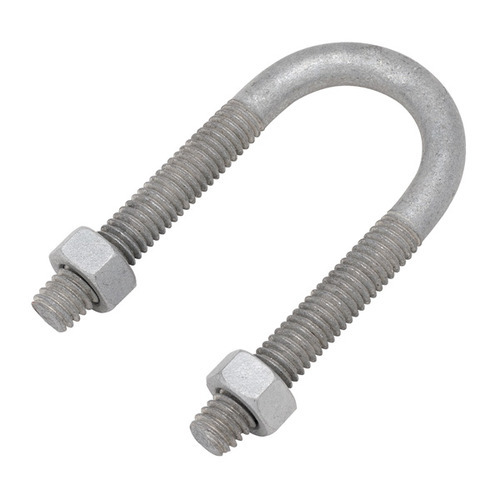 These Monel U-Bolts display high strength, durability, flawless finish and excellent corrosion resistance. Available in different dimensions & grades, our range is delivered with zero defects High strength and rust resistances are the major features of Monel U-Bolts offered by us. Established in 2006, we, Piyush Steel Pvt. Ltd. holds the forte to be one of the most renowned firms since its inception. We are involved in manufacturing, supplying and exporting Ferrous and Non-Ferrous Metal products that include Pipe Fittings, Buttweld Fittings, Forged Fittings, Sheets and Plates. Despite from manufacturing and supplying steel products we are also entangled in stocking Alloy Steel Bushing, Alloy Steel Pipe, Carbon Steel Bushing and Carbon Steel Bends. We ensure our range is designed in compliance with the ASTM, ASI, DN and BIS standards. We manufacture our products using excellence grade raw materials. Our products are widely used in Petro-chemical and Nuclear Industries. With our high skilled scientist in Research and Development sector Piyush Steel introduces innovative series of first-rated quality products made from stainless steel & super ferritic steel as well as steel which is resistant to bacteria. In order to build a strong customer base we also supply raw materials that include Inconel & Monel, Alloy Steel, Carbon Steel, Copper and Alloy Steel Pipes. Comparing to domestic counterparts, steel products manufactured by our company is highly praised and some international companies are interested in marketing steel products of Piyush Steel Company as it comprises superior quality products. We are mainly looking for export query from Gulf Countries (Iran, Saudi Arabia, Qatar, Oman, Bahrain, U.A.E. & Kuwait), Malaysia, Indonesia, Singapore, Thailand, Turkey, Mexico etc.